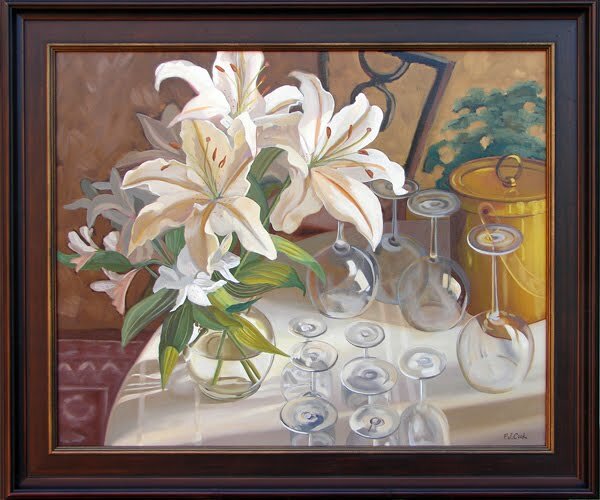 This original still life with flowers is a recent oil painting of mine that is framed in a beautiful wood frame. The painting would look nice in a dining room just in time for Thanksgiving. The overall dimensions are 30″ x 36″ and the painting is on canvas. All the detail of the glass wine goblets and the flowers were quite time consuming. I have this original still life painting on display at the Hidden Gallery in Old Lyme, CT. If you have any questions about the painting please contact me. Update: this painting has been sold.